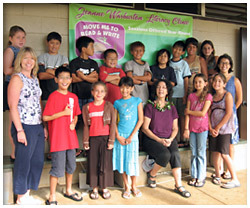 Summer 2012 Literacy Clinic from Read Kauai! Literacy programs specializing in multisensory techniques. Help your student develop literacy skills. Ellen Leckrone is a certificated Educational Consultant and Instructional Specialist with The ARK Institute of Learning in Tacoma, Washington. She holds a Bachelor of Arts in Education from Western Washington University focusing on Individualized Instruction for elementary and secondary education, along with a focus in Sociology. Ellen currently assesses and analyzes instructional needs of students. She also plans and implements language-based instructional strategies in reading methods, language structure and symbol stabilization and she designs progress reports reflecting growth, recommendations and accommodations. Ellen has been an asset to the summer clinic while enjoying family time on Kauai. One of Island School�s stated missions is to provide a facility that services students and families of the Kauai community when their daily classes are not in session. By providing a clinical setting we are able to assist any Kauai families in achieving literacy awareness and proficiency. As the Learning and Literacy Resource Teacher for Island School, Elizabeth Scamahorn M. Ed. provides intensive English intervention to students who have an academic or developmental history of Standard English delays. Island School provides a safe and accredited facility in which to hold this clinic. How to be a Great and Effective Learner! The clinic setting allows students to discover how to be �great learners� by manipulating the English language. Students can develop an understanding of different abilities and realize the uniqueness of any learner. Each student works in many areas at a reasonable pace. They learn the skills and strategies for expressing and receiving language in reading, writing, speaking, and pragmatics. Students learn how to notice and put to use the differences between common oral language (pragmatics) and academic language. Students learn to edit their writing using a variety of skills and strategies. Because the teachers are trained in a blend of multisensory methodologies, students receive information in ways which help them feel good about learning. A final report is given to all parents. Ms. Scamahorn is available for conference time with students, parents, and teachers during the school year. Students and parents are encouraged to use the clinic notebook, and it becomes a homework tool throughout the year. The Annual Jeanne Warburton Memorial Literacy Clinic will have no more than 16 students and will provide instruction for students in grades 3rd to 6th. The Literacy Clinic is an intensive introduction to English language for the purpose of communicating more effectively. Students are assessed for placement before the clinic begins. Each student and parent selects an individualized goal plan. A focal point of the clinic is to clarify students� and parents� understanding of �what it means to be literate'. The Annual Jeanne Warburton Memorial Literacy Clinic provides 64 hours of instruction through multisensory techniques and self-guided discovery. Students� interactions are manageable and enjoyable. Oral language, or pragmatics is an important skill as students are instructed how to talk about a subject using academic language techniques. The Linguistics Lab provides stations where students learn to work on their own and in small groups. Each student makes a binder, which corresponds with the areas of language addressed in the lab and is used for homework. Homework and oral participation are rewarded daily when two students are selected to receive the �Learners Cup� for positive learning. Everyone has success! Each day six steps from research in No Child Left Behind emphasize five essential skills: Phonemic Awareness, Phonics, Fluency, Vocabulary, pragmatics and Comprehension. These areas are tailored to individual needs - so students experience a balance of the weakest with strongest skills. Instruction of visual imagery techniques is a process used to comprehend written material. Each student will learn as fast as he can or as slowly as he must -because pacing is a key component. Methodology is the critical component in this program. The summer clinic students are not typical learners; therefore, methodology is prescriptive of individual needs and structured into the pacing of the instruction. Three teachers (sixteen students) allow the students to move as slowly as necessary and as quickly as possible. Experiences with Stations emphasize fluency, vocabulary, comprehension through sentence structure, multiple meanings, word building words for using spelling, visualization techniques, and strategies. All activities are multi-sensory and engage students in hands-on manipulation of cards, words, phrases and sentences. Words using the sound-spelling associations are analyzed for patterns. Fluency emphasizes accurate and automatic word recognition. Phonograms, spelling generalizations, syllable types, and syllabication are components of sound-spelling correspondence. The process of �scooping� is one technique used to read or write for fluency by developing the ability to question each scooped phrase or word. The family literacy component aligns with student instruction to provide parents with literacy terms, perceptual imagery understanding, and support strategies during the clinic. Parents are asked to commit to five hours of attendance with their child/student; the interaction is set up so the student can show and tell, and the parent can listen, look, question and learn techniques. In addition, two parent meetings are scheduled for each clinic. Parents support use of strategies during homework as part of the family involvement. Through our emphasis on Family Support, parents realize that they can become positive, powerful advocates in their child�s life. At the end of the clinic, students are tested to show criterion based degrees of improvement on at least one of these standardized assessments as compared to entry-level scores: Spelling Inventory, Test of Silent Word Reading Fluency or Degrees of Reading Power Comprehension Test. Students will read, write, or speak with better fluency and automaticity compared to their entry level. Parents develop positive attitudes about approaching their child�s weaknesses because goal setting and strategies reveal a better understanding of study skills. At the conclusion of the summer clinic test data is used to provide written reports, and to assist teachers and parents in program planning. In order to determine progress during the clinic experience, growth is measured by repeating the same evaluation tools used for placement. This data provides indicators of growth through standard and grade level scores. Words Their Way Spelling Inventory spans the spelling patterns of short and long vowels, combinations of vowels, consonant blends and multi-syllable words. Test of Silent Word Reading Fluency (TOSWRF) gives a grade level and standard score of single word decoding fluency. Degrees of Reading Power tests comprehension with grade level and standard scores. A variety of writing assignments are compared to assess use of spelling, punctuation, sentence structure, and word choice. A final report is given to all parents. Donated conference time with students, parents, and teachers during the school year is available. Students and parents are encouraged to use the clinic notebook throughout the year. The Annual Jeanne Warburton Memorial Literacy Clinic hosted by Island School has resounding successes. The literacy clinic, created to fulfill a promise to a dying friend and colleague, is designed to enhance all literacy skills�reading, writing, thinking, speaking, and listening. Jeanne Warburton (Lyons) was a Kauai Department of Education Teacher and family support worker in early education for learning and language differences. She believed that many children with and without learning differences do not learn by osmosis and need something better. Jeanne Warburton was a lifelong teacher of learning disabled youth. She taught at Koloa Elementary School for 12 years, several years as an independent educator of literacy skills, and the last three years as an early intervention specialist for mothers with newborns. Her love of language and communication skills made her an asset to her community. Together with Elizabeth and other master teachers, they conducted summer literacy clinics and often tutored dyslexic students. Jeanne valued training in such programs as Spalding, Slingerland, Orton Gillingham, Lindamood Phoneme Sequencing Program for Reading, Spelling, and Speech, and the comprehensive intervention curriculum LANGUAGE! All of these are multisensory methods or programs containing techniques that are systematic, structured, sequential, and cumulative. The literacy clinics continue to keep Jeanne�s dream alive: to help all Kaua'i children to be effective communicators.